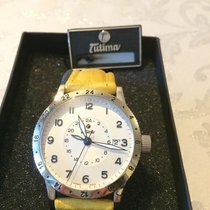 This Watch Is iN Great Condition For A Previously Used Timepiece. 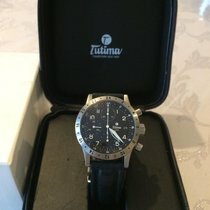 Please Refer To The Pictures iN Determining Condition, Pictures Are Of The Exact Watch Being Offered. The 38mm Case Is Made Of Stainless-Steel With A Solid Case Back And Screw-iN Crown. Also Features A Bi-Directional Rotating Bezel With A 24-Hour Scale Engraved On It And Two Pushers To Operate The Chronograph Movement. Water Resistance Can Reach Up To 100 Meters (330 Feet). Time Is Exhibited On A Black Dial With Arabic Numerals. Also Includes Three Sub-Dials And A Date Aperture. The Hour And Minute Hands, Plus The Arabic Numerals Have All Undergone A Luminescent Coating For An Enhanced Legibility. An Outer Ring Circling Near The Bezel Has White Index Minute Markers And A 24-Hour Arabic Numeral Scale. There Is An Extra UTC Hand To Indicate A Second GMT Time Zone. Currently Mounted On The Watch Is A Generic Black Leather Strap With Exposed White Stitching And Secured To The Wrist By A Tumina Stainless-Steel Pin Buckle. It Will Also Include An Original Tutina Black Leather Strap Which Has Half Its Life Left. Powered By A Self-Winding Mechanical Movement, Caliber Valjoux ETA 7750 With 25 Jewels And 28,800 vph. Power Reserve Can Last Up TO 44 Hours When Fully Wound.